I decided at the last minute, like, almost literally the last minute, to attend the Women’s Journey of Faith conference in Saskatoon on the weekend. The key note speaker was Lisa Bevere, who, frankly, I had not heard of before. She was wonderful. Strong, passionate, funny. It was a fabulous conference and I’m so glad I went. I almost didn’t go because of the hassle going presents. I was approaching the trip like I was taking medicine! Okay, I’ll go because I recognize I need to be encouraged and this opportunity is here, so I’ll take it. And now I’m thinking, when did I get old and crotchety? Since when has going on an adventure become a hassle? I have always loved going and doing and trying new things. And this wasn’t even that big of a deal. A three hour drive, for goodness sake. And I didn’t have to do any of the driving or arranging or anything. All I had to do was hop in the van with nine other women and go. Well, I had to change some appointments, and back out of a meeting, and miss spending time with my husband who is only home on the weekends … I mean there was some cost involved. But it was all pretty easy stuff to take care of, really. And my husband, bless his heart, was encouraging me to go. If you want to go, then go, he kept saying. And I thought, I am not usually one who needs to be cajoled into going along for some fun. When did this happen? Am I soon going to start complaining about my sore back, and fussing that I can only sleep in my own bed? Am I going to become one of those people? One of those people who misses out on life because of the work it sometimes requires to live life. It has been a wake up call. Which gives me a really cool segue into the conference weekend, because the theme was AWAKEN. Bottom line — wake up! Don’t sleep walk through life. Be stunning. Be women who give the enemy something with which he needs to contend. Be a little dangerous! I went to court a few days ago. A sad, unsettling experience. I sat in the waiting room at the court house with numerous social workers, foster parents, and education specialists, all waiting our turn to assist in the termination of a mother’s parental rights. All of these people had been involved in some way in this little family’s life. The mother didn’t show up. The judge went ahead with the trial. Enough is enough, I guess he thought. It went quickly. There was no defense, so there was no cross examination. I was last on the stand. I answered the questions I was asked, and I was done. Wait, I wanted to say. There’s so much more. I haven’t told you about the way she cried in her sleep almost every night. Or how she squealed the first time she went down a water slide and then wouldn’t come out of the water for hours. Or how she pushed people away with her attention-seeking behaviour. Or how she cried after visits with her mom, because maybe I would die and then what would she do? Or about the time she took all the other children’s Christmas candy and ate it and then threw up in the night. Or the stories that she told of the things that happened to her while in her mother’s care. Or how I loved her in spite of everything. It was a little bit like trying to give a eulogy, perhaps. How do you sum up a life in a few sentences? In fact, the experience was not unlike a funeral. When I was finished, I walked out of the court house into the fresh, cold air and I thought, it is a terrible thing to contribute to the death of a mother. The decision-making process in this type of case usually takes several weeks or even months. A social worker called me yesterday. The judge signed everthing immediately. It’s done. My girl is safe. I remember the day I took her for her good-bye visit. How do you say a forever good-bye to your mother when you are six years old? How do you take a child out of her mother’s arms, forever? She put her no-longer-daughter into my vehicle. Thanks, Janelle, she mumbled, not looking at me, and she started to walk away. I looked after her for a second, this wounded woman who had caused so much pain in the life of this child I loved. I said her name and when she turned I hugged her. No, Jesus hugged her, and I whispered, Get better. Get better, because some day this little girl might come looking for you. And don’t you want her to find you whole? I don’t know what will happen in the lives of these people. I do know that there but for the grace of God go I. I could have been born into poverty and addiction and disfunction. I could have been born into lots of things that weren’t the loving, caring family and church and community with which I was blessed. And still, I am a broken vessel. Chipped, scarred. But willing. Willing to be used in my shabbiness. So I give thanks for the blessings, and I pray that out of blessings will come blessings. That my Father God will use me to bless. To share Him whenever and however I can. Remembering today the broken moms, the struggling moms, the hurting moms, and the no-longer moms. fold little pink things in the laundry. As always, these precious little girls have very uncertain futures. As always, I’d keep them if I could. As always, we will just take things day by day. I was Mom to a little girl for a year. She left a month ago. For a year, I tucked her into her bed each night and listened to her say her prayers. I took her trick-or-treating. I planned her sixth birthday party, and bought her Christmas presents, and went to her parent-teacher interviews, and clapped for her at her Christmas concert. I sang with her while we waited for the school bus. I picked her up from a stranger’s home the night she ran away. We talked about respect and privacy and honesty and “appropriate behaviour”. I found my diamond ring in the pocket of her blue jeans, and my makeup in her backpack. We talked about lying and stealing and “appropriate behaviour”. She told me I looked pretty when I was trying to look pretty. She noticed when I wore new earrings, or got my hair cut. She loved frilly clothes. She wanted to be beautiful when she grew up. When she came to live with us, one of the first things she asked was whether she would still be with us for Happy Hallowe’en. She was a princess. Life is easier now. Calmer, quieter, more peaceful. But I miss her. *** It has been over a year now since my last little one left. She will turn eight on her next birthday. I don’t know how she is doing, but I pray for her, and the other children, often. Plan B was published in 2005, six years after Traveling Mercies. I love Anne Lamott, and I loved this book. I found Plan B at Chapters in Regina a few days ago, a $6.99 bargain. I think God wanted me to find it and read it. At the writing of this book, Anne is fifty-ish, her son is in the throes of adolescence, and George W. Bush is on the throne. Scary, uncertain times. Scary uncertainties that I can relate to. These are the things I underlined. on Rahab … Why did she hide them, since, by the calculus of the world, that act endangered her? She did it because she was desperate, and so she listened to her heart. Bono, of U2, who is a Christian, says that his favorite song is “Amazing Grace” and his second favorite is “Help Me Make It Through the Night,” and most of the time, I have to let it go at that. … with writing, you start where you are, and you usually do it poorly. You just do it – you do it afraid. And something happens. … she had drowned in those uncried tears. I know that with writing, you start where you are, and you flail around for a while, and if you keep doing it, every day you get closer to something good. … what doesn’t help is the terrible feeling of isolation, the fear that everyone else is doing better than you. And I planted bulbs, which is a form of prayer. God doesn’t want or expect you to get it together before you come along, because you can’t get it together until you come along. You can spend half of your time alone, but you also have to be in service, in community, or you get a little funny. On the day I die, I want to have had dessert. Finally, we stood outside an inner gate, showed our IDs to the guards, and got our hands stamped with fluorescent ink. “You don’t glow, you don’t go,” said one cheerful, pockmarked guard, which was the best spiritual advice I’d had in a long time. A lot of stuff falls off – your vision, your youth, your memory – but better stuff is left behind. … the opposite of faith is not doubt, but certainty. Certainty is missing the point entirely. Thank you, Anne Lamott. I needed that. Sunday afternoons are one of my favourite times of the week. We try to keep them as obligation-free as possible. For the sabbathing that we need. The down time. Rest. Space. Yesterday was perfect. 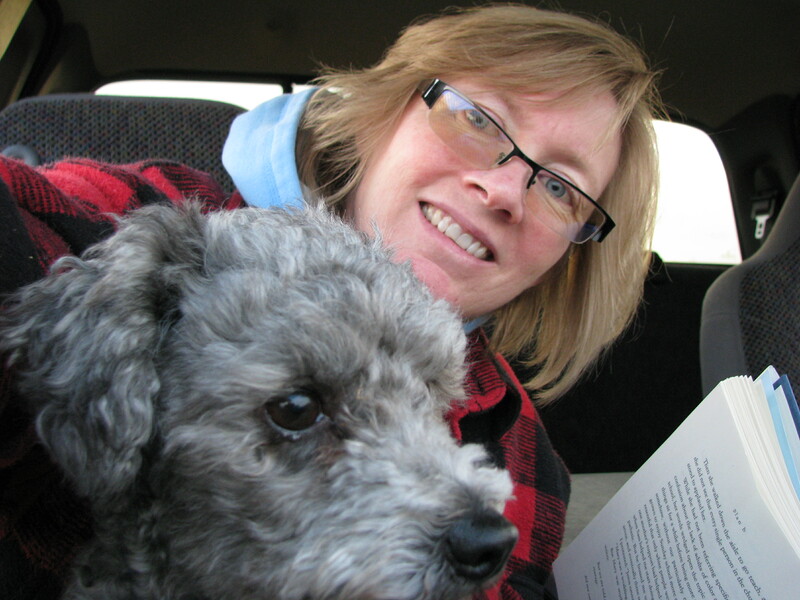 Church in the morning (after the boys checked their traps … one muskrat, first one of the season!) and an easy lunch (warmed leftover soup and biscuits) and then a glorious nap. Well, I napped. 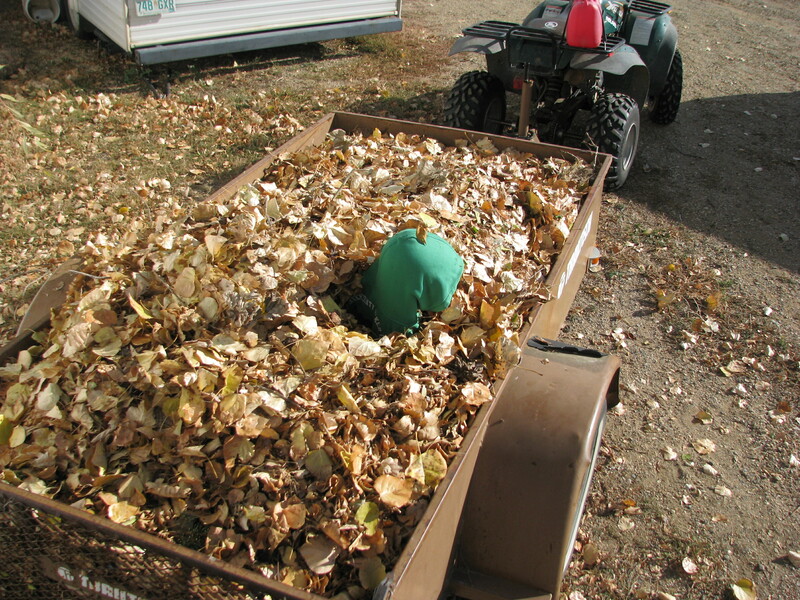 The boys were busy raking and transporting leaves from the yard area to the I-don’t-care-what-this-looks-like area. And of course it was accomplished in their unique way. Involving quads and trailers and their own version of the ball room at the McDonalds play place. 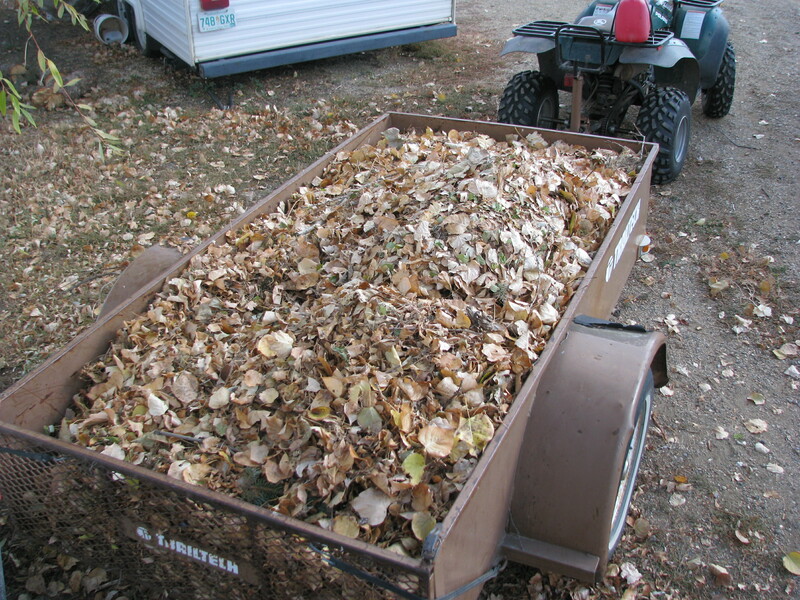 No simple raking and bagging at this house. No sir. That would be too … normal. And for supper I made pizza. 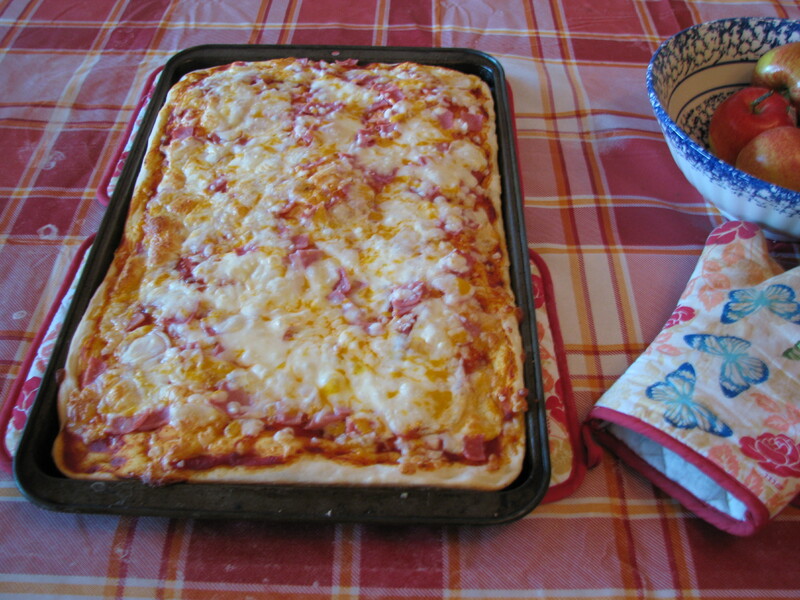 They all love my homemade pizza, so I make it often on Sunday evenings. It is a yeasty, yummy, homey-smelling gift I can give, but without all the work of, say, making bread. So, yesterday we had pizza for supper. Ham and cheese. 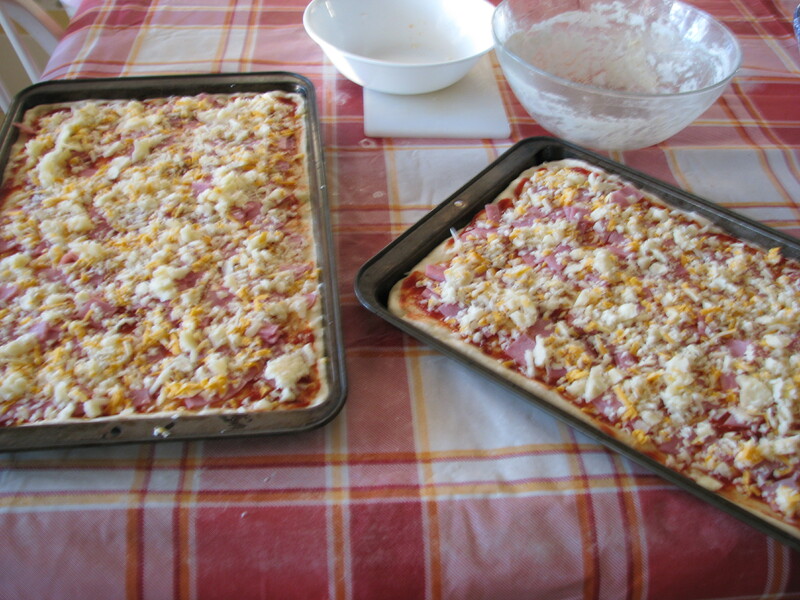 I actually really enjoy the pizza-making process. 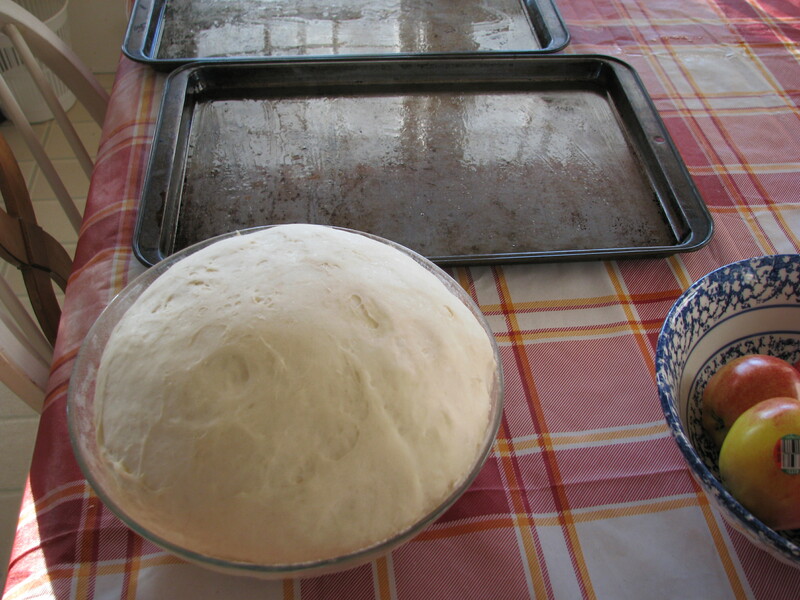 Mixing and kneading the dough, and setting it on the open oven door for a little heat, covered by its own dish cloth blankie to keep it warm while it rises. 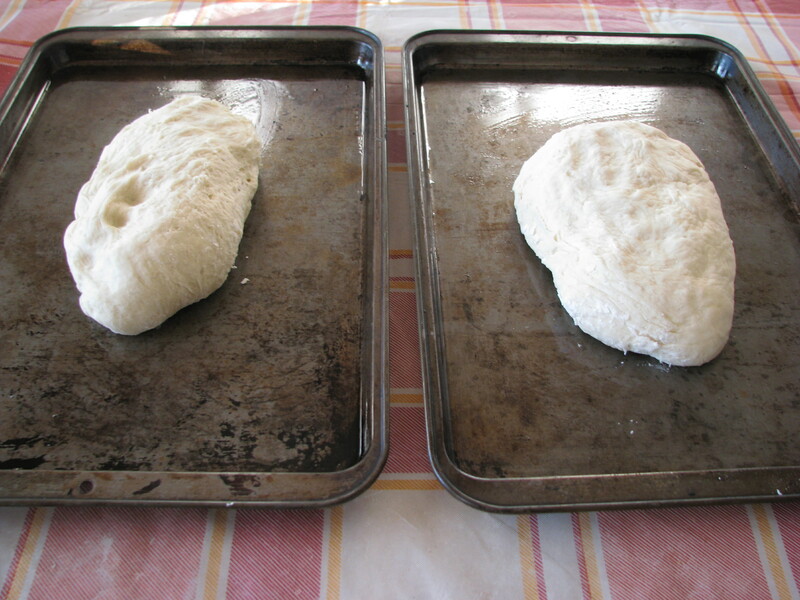 Dividing it into two loaves and stretching them out to cover greased-shiny pans. 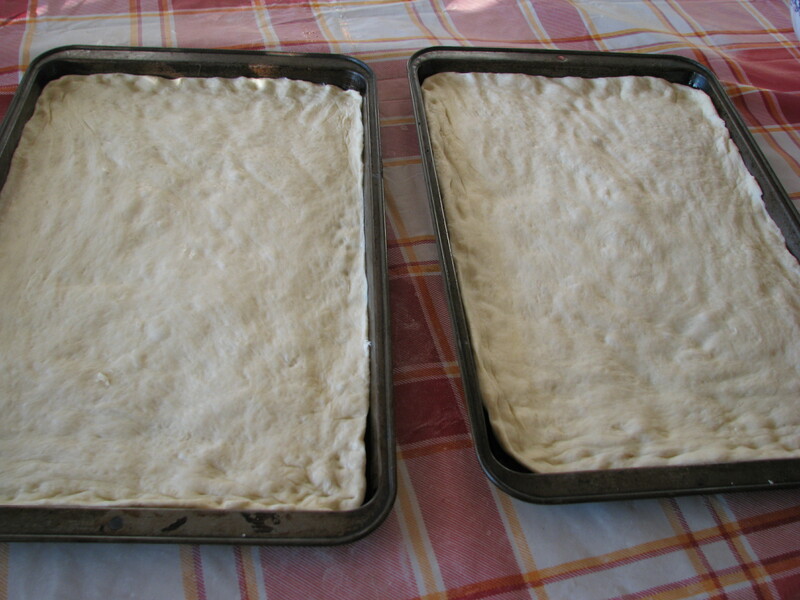 I love how the dough resists the stretching at first, but if it rests for a minute then it submits to the stretching again. Dough sabbath. Rest and stretch. And I love how my fingerprints mark the dough skin, dimpled by its submission. And then the covering. The sauce and the ham and the cheese. Simple, uncomplicated attire for a humble meal. But so delicious and fragrant and appealing. It is Sunday morning, and my mind is wandering a bit, as it often does, to the day before. Saturday. To the day of loving my family. To the worship that was easy. To the almost-evening question from the one who still smiles his smile at me, do you want to go for a drive? I’m going out for a bit. 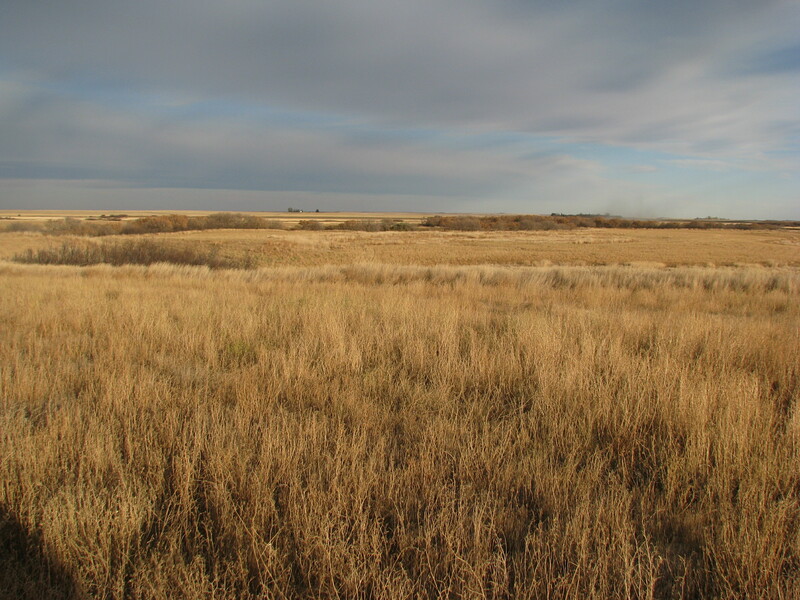 And it’s easy to answer yes, and to grab camera and book and blanket and dog, and to hop in the truck, and to marvel as we drive at the beauty of the autumn-dressed prairie. 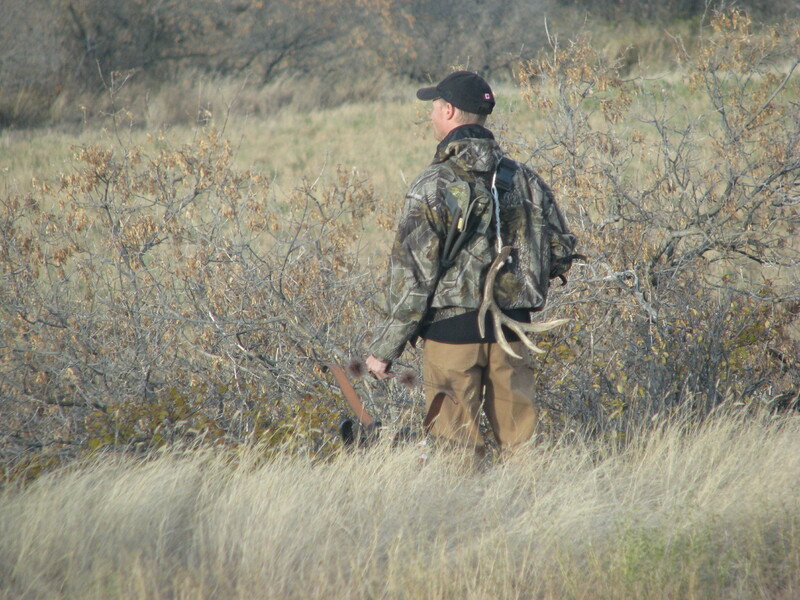 And to watch him walk toward the creek with bow in hand, and to gaze across the field and just let it all sink in. And to snuggle under my warm blanket and read Anne Lamott’s words and cuddle my dog on my lap, and just breathe it all in. But that was yesterday. Today is Sunday, the day ordained for worship. The do not neglect the gathering of the saints day. Church day. After a small, precious, alone-in-the-house kind of time, quiet and peaceful, I will wake up the noisy crowd. And they will eat and shower and dress, and I’ll send at least one back upstairs to change into something that doesn’t have holes in it and whoever he is will complain that it’s church, mom, it’s not a fashion show. And I’ll reply that I agree, but I know there is something in your closet that is hole-free and that is what I would like you to wear today. And there may be shrugs or eye roles, but whoever he is will do as he is asked because my boys are, basically, good sons. And I will treasure the hugs from the son who hugs easy, and seek the hugs from the ones who don’t. And my husband will make coffee from freshly ground coffee beans. And then we will tumble into the car, hurry, hurry, and go to church. When I was little, people didn’t say they were going to church. They said they were going to services, or they were going to meeting. Because the word church, as I heard in many a sermon, means “the people” and is not “a place”. So it is not somewhere you can go. But I am rebellious so now I say I am going to church, even though something in me always corrects myself, reminding me that I am not using the word correctly. We were very big on doing things correctly when I was little. So we will go to church. And worship. At least we will try to. We will offer our worship to God, holy and acceptable and pleasing to Him. With songs and prayers and sermons and Sunday School. And it seems like so little and so much at the same time, this institutional, congregational, group worship that we do each Sunday. I love this tribe of mine. I am so happy, like jump up and click your heels happy, that God has blessed me with this husband and these three boys. We are not a perfect family by any means. Far from it. But we belong to each other, and today, in my overwhelmedness, I am loving them. Consciously and thankfully and prayerfully. So, chicken soup is simmering on the stove, laundry is whirling away in the machine downstairs, and muffins are on the way. The laundry and the cookies and such are one of the ways I love them, but, really, that’s the easy stuff. Today, I’m loving my family by really listening when my husband needs to vent about his job. and by acknowledging how tough it is for him at times. I’m loving him by returning his smile, and visiting with him over that second cup of coffee. I’m valuing him as my husband and the father of my boys. I’m thanking him for his hard work. 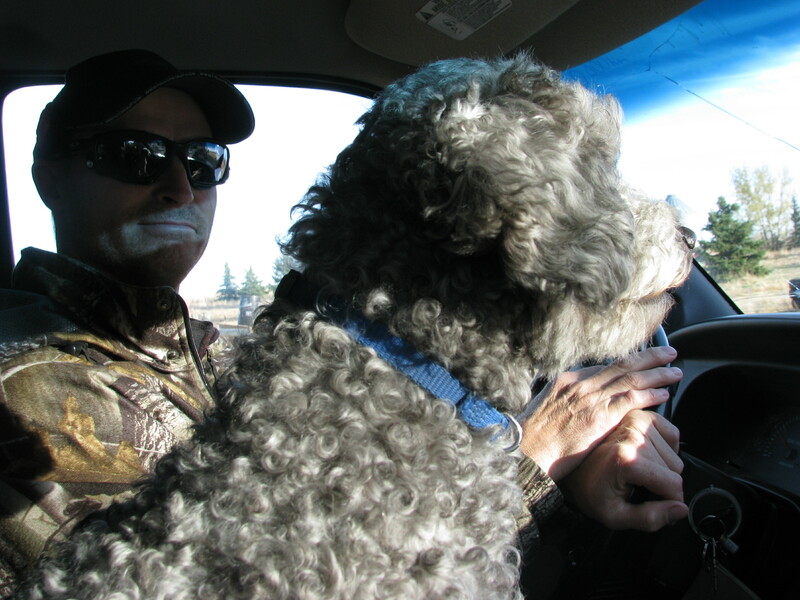 Today, I’m loving my boys by asking (telling!) them that they need to help with some house and yard work. On a Saturday. When they would rather be lazy and do what they want. And I’m handing out rakes and garbage bags and putting a list of things to do on the fridge. And I am thanking them ahead of time for their good attitudes, and planning hot chocolate and fresh muffins for them when they tumble back inside, glowing from hard work and fresh air. And I’m already saying yes to the questions I know will come later. The will you play cards with me?, and the will your read to me?, and the can we watch a movie together?. And I’ll bring out the afternoon’s labours of love, fresh and fragrant, or maybe I’ll make popcorn, and we will share the evening together. Ah, and just when I’m feeling all loving and parental and proud and such, in marches the youngest with his list of accomplishments and his grumbling about the more that there is to do. And I call an I love you to his stiff, retreating back, and I say a prayer as I hear him mutter his way down the stairs to clean the basement. Not perfect. No. But a family.